In the wake of the defeat of House Majority Leader Eric Cantor in Virginia’s June 10 Republican primary some media commentators, who an hour before the polls closed were pronouncing the Tea Party movement dead, have now decided that grassroots conservatives are an irresistible force that will sweep all before it in the upcoming Republican primaries. We wish that were true. However, if that prediction is to become reality, it will only be because conservatives buckled-down and did the hard work necessary to make it so. Dave Brat defeated Eric Cantor because he had a simple message about going to Washington and standing for the basic conservative principles of the Republican Party. And because he and his grassroots supporters knocked on thousands of doors, made phone calls, sent email, posted on social media and made the case for change in every forum they could find. If Dave Brat’s success is to be replicated then we conservatives are going to have to work just as hard in such key races as tomorrow’s Mississippi Senate runoff where conservative Chris McDaniel faces 36-year incumbent Senator (and porkbarreller-in-chief) Thad Cochran. The Haley Barbour political machine and the DC Republican establishment are playing for all the cookies in Mississippi. The National Republican Senatorial Committee raised $800,000 for Cochran at just one fundraiser. And the US Chamber of Commerce has booked $308,000 in airtime on broadcast stations across the state. The ads already cover markets in Biloxi, Jackson, Meridian, Hattiesburg, Greenwood and Columbus-Tupelo. Plus reports of machine politics continue to come in with allegations that the establishment Republican political machine of Haley Barbour is trying to turnout Democrats to vote in the Republican primary and it is alleged even paying them to do so. 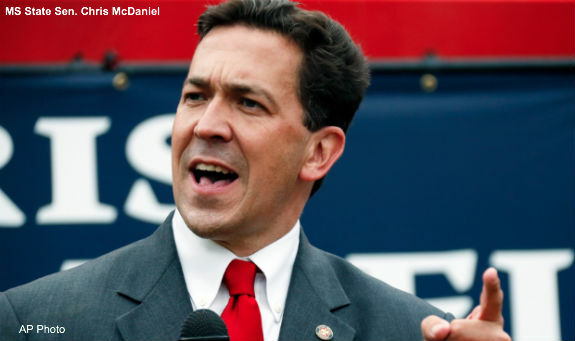 McDaniel stands as much as 12 points ahead of Cochran in the polls, a very bad sign for a longtime incumbent, but the establishment won’t go quietly or easily. If conservatives want to make media predictions of a limited government constitutional conservative wave come true then we have to do what Dave Brat did in the final 24 hours of his campaign; hit thousands of doors, make phone calls, send email, post on social media and make sure every voter in Mississippi who demands change in Washington gets to the polls tomorrow, June 24, and votes for Chris McDaniel for Senator. Submitted by freePatriot on Mon, 06/23/2014 - 12:13. The corruption in politics is so much worse than I thought. Many of the people trying to stop McDaniel call themselves 'conservative'. They are siding with Socialists/Democrats to keep him from DC because he is Conservative. Unbelievable, we must purge DC of these lifetime politicians.